The Wright brothers, Orville (August 19, 1871 – January 30, 1948) and Wilbur (April 16, 1867 – May 30 1912), were two Americans credited with building the world's first successful fixed-wing aircraft and making the first controlled, powered and heavier-than-air human flight on December 17, 1903. In the two years afterward, they developed their flying machine into the world's first practical fixed-wing aircraft. The brothers' fundamental breakthrough was their invention of "three axis-control," which enabled the pilot to steer the aircraft effectively and to maintain its equilibrium. This method has become standard on fixed wing aircraft of all kinds. From the beginning of their aeronautical work, the Wright brothers focused on unlocking the secrets of control to conquer "the flying problem," rather than on developing more powerful engines as some other experimenters did. They gained the mechanical skills essential for their success by working for years in their shop with printing presses, bicycles, motors, and other machinery. Their work with bicycles in particular influenced their belief that an unstable vehicle like a flying machine could be controlled and balanced with practice. The achievement of flight is among the most epochal advances in humanity's quest to discern physical laws and adopt technologies to master the environment. Perhaps more than any single technological innovation, the success of flight symbolized the near limitless potential of human thought, imagination, and inspiration to meet seemingly insurmountable barriers and defy received beliefs. 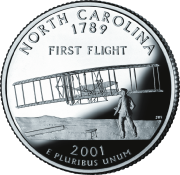 The 12-second, 120-foot flight at Kitty Hawk, North Carolina, inaugurated a revolution in transportation, military capability, and the global economy over the succeeding century. Building upon the Wright Brothers' breakthrough, government-sponsored space exploration led to the first landing on the Moon by the American Neil Armstrong in 1969. Future explorations of remote planets and stars are envisioned by both scientists and the lay public in the context of this paradigm-changing first flight. The Wright brothers were two of seven children of Milton Wright (1828-1917) and Susan Catherine Koerner (1831-1889). Wilbur Wright was born in Millville, Indiana in 1867; Orville in Dayton, Ohio in 1871. The brothers never married. The other Wright siblings were named Reuchlin (1861-1920), Lorin (1862-1939), Katharine (1874-1929), and twins who died in infancy). In elementary school, Orville was given to mischief and was once expelled. In 1878 their father, who traveled often as a bishop in the Church of the United Brethren in Christ, brought home a toy "helicopter" for his two younger sons. The device was based on an invention of French aeronautical pioneer Alphonse Penaud. Made of paper, bamboo and cork with a rubber band to twirl its rotor, it was about a foot long. Wilbur and Orville played with it until it broke, then built their own. In later years, they pointed to their experience with the toy as the initial spark of their interest in flying. In the winter of 1885-1986 Wilbur was accidentally struck in the face by a hockey stick while playing an ice-skating game with friends. He had been vigorous and athletic until then, and although his injuries did not appear especially severe, he became withdrawn, and did not attend Yale as planned. Had he enrolled, his career might have taken a very different path than the extraordinary one he eventually followed with Orville. Instead, he spent the next few years largely housebound, caring for his mother who was terminally ill with tuberculosis and reading extensively in his father's library. He ably assisted his father during times of controversy within the Brethren Church. However, he also expressed unease over his own lack of ambition. Both brothers received high school educations, but did not receive diplomas. 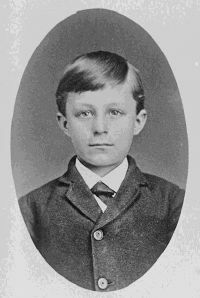 The family's move in 1884 from Richmond, Indiana to Dayton (where the family had lived during the 1870s) prevented Wilbur from receiving his diploma after finishing four years of high school. Orville dropped out after his junior year to start a printing business in 1889, having designed and built his own printing press with Wilbur's help. Quietly starting a partnership with far-reaching consequences, Wilbur joined the print shop, serving as editor while Orville was publisher of the weekly newspaper the West Side News, followed, for only a few months, by the daily Evening Item. Capitalizing on the national bicycle craze, they opened a repair and sales shop in 1892 (the Wright Cycle Exchange, later the Wright Cycle Company) and began manufacturing their own brand in 1896. They used this endeavor to fund their growing interest in flight. In the early or mid-1890s they saw newspaper or magazine articles and probably photographs of the dramatic glides by Otto Lilienthal in Germany. The year 1896 brought three important aeronautical events. In May, Smithsonian Institution Secretary Samuel Langley successfully flew an unmanned steam-powered model aircraft. In the summer, Chicago engineer and aviation authority Octave Chanute brought together several men who tested various types of gliders over the sand dunes along the shore of Lake Michigan. In August, Lilienthal was killed in the plunge of his glider. These events lodged in the consciousness of the brothers. In May 1899 Wilbur wrote a letter to the Smithsonian Institution requesting information and publications about aeronautics. Drawing on the work of Sir George Cayley, Chanute, Lilienthal, Leonardo da Vinci, and Langley, they began their mechanical aeronautical experimentation that year. The Wright brothers always presented a unified image to the public, sharing equally in the credit for their invention. Biographers note, however, that Wilbur took the initiative in 1899-1900, writing of "my" machine and "my" plans before Orville became deeply involved when the first person singular became the plural "we" and "our." Author James Tobin asserts, "it is impossible to imagine Orville, bright as he was, supplying the driving force that started their work and kept it going from the back room of a store in Ohio to conferences with capitalists, presidents, and kings. Will did that. He was the leader, from the beginning to the end." The Wrights did all the theoretical work and most of the hands-on construction. Their bicycle shop employee Charlie Taylor became an important part of the team, building their first aircraft engine in close collaboration with the brothers. Despite Lilienthal's fate, the brothers favored his strategy: to practice gliding in order to master the art of control prior to attempting flight with a motor. The death of British aeronaut Percy Pilcher in another hang gliding crash in 1899 only reinforced their opinion that a reliable method of pilot control, not elusive built-in stability, was the key to successful—and safe—flight. At the outset of their experiments they regarded control as the unsolved third part of "the flying problem." They believed sufficiently promising knowledge of the other two issues—wings and engines—already existed. The Wright brothers thus differed sharply from more experienced practitioners of the day, notably Ader, Maxim and Langley who built powerful engines, attached them to airframes equipped with unproven control devices, and expected to take to the air with no previous piloting experience. Though agreeing with Lilienthal's idea of practice, the Wrights saw that his method of balance and control—shifting his body weight—was fatally inadequate. They were determined to find something better. Based on observation, Wilbur concluded that birds changed the angle of the ends of their wings to make their bodies roll right or left. The brothers decided this would also be a good way for a flying machine to turn—to "bank" or "lean" into the turn just like a bird—and just like a person riding a bicycle, an experience with which they were thoroughly familiar. Equally important, they hoped this method would enable recovery when the wind tilted the machine to one side (lateral balance). They puzzled over how to achieve the same effect with man-made wings and eventually discovered wing-warping when Wilbur idly twisted a long inner tube box at the bicycle shop. Other aeronautical investigators regarded flight as if it were not so different from surface locomotion, except the surface would be elevated. They thought in terms of a ship's rudder for steering, while the flying machine remained essentially level in the air, as did a train or an automobile or a ship at the surface. The idea of deliberately leaning, or rolling, to one side either seemed undesirable or did not enter their thinking. Some of these other investigators, including Langley and Chanute, sought the ideal of "inherent stability," believing the pilot of a flying machine would not be able to react quickly enough to wind disturbances to effectively use mechanical controls. The Wright brothers, on the other hand, wanted the pilot to have absolute control. For that reason, their early designs made no concessions toward built-in stability (such as dihedral wings). They deliberately designed their 1903 first powered flyer with anhedral (drooping) wings, which are inherently unstable, but less susceptible to upset by gusty sidewinds. In July 1899 Wilbur put wing-warping to the test by building and flying a five-foot box kite in the approximate shape of a biplane. When the wings were warped, or twisted, one end would receive more lift and rise, starting a turn in the direction of the lower end. Warping was controlled by four lines attached to the kite. The lines led to two sticks held by the kite flyer, who tilted them in opposite directions to twist the wings and make the kite bank left or right. It worked. In 1900 the brothers journeyed to Kitty Hawk, North Carolina to begin their manned gliding experiments. They chose the location based on advice from Octave Chanute (answering Wilbur's letter), who suggested a sandy coastal area for regular breezes and a soft landing surface. They selected Kitty Hawk after scrutinizing Weather Bureau data and writing to the government meteorologist stationed there. The location, although remote, was closer to Dayton than other places Chanute had suggested, including California and Florida. The spot also gave them privacy from reporters, who had turned the 1896 Chanute experiments at Lake Michigan into something of a circus. The trip required a train ride from Dayton to Cincinnati; change trains for an overnight ride to Old Point Comfort, Virginia (near Newport News); ferryboat to Norfolk; train to Elizabeth City, North Carolina; and boat ride to Kitty Hawk on the Outer Banks of North Carolina. They based the design of their first full-size glider on the work of their recent predecessors: the Chanute-Herring "double-decker," a biplane hang glider which flew well in the 1896 experiments near Chicago; and aeronautical data on lift that Lilienthal had published. 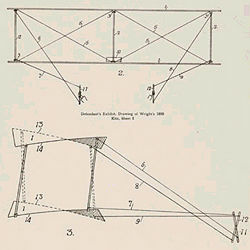 The uprights between the wings of their glider were braced by wires in their own adaptation of Chanute's modified "Pratt truss," a bridge-building design he applied to his 1896 glider. The Wrights mounted the horizontal elevator in front of the wings rather than behind, apparently believing this feature would help avoid a nosedive and crash like the one that killed Lilienthal. 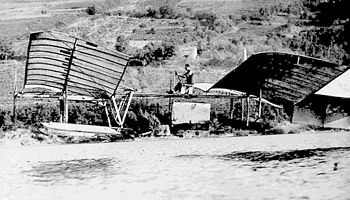 (Later, when Santos-Dumont flew his 14-bis in Paris in 1906, the French dubbed the tail-first arrangement a "canard," due to the supposed resemblance to a duck in flight.) According to some Wright biographers, Wilbur probably did all the gliding until 1902, perhaps because he was the older brother and to assume the risk of the trial. The brothers flew the glider only a few days in the early autumn of 1900 at Kitty Hawk. In the first tests, probably Oct. 3, Wilbur was aboard while the glider flew as a kite not far above the ground with men below holding tether ropes. Most of the kite tests were unpiloted with sandbags or chains (and even a local boy) as onboard ballast. They tested wing-warping using control ropes from the ground. The glider was also tested unmanned while suspended from a small homemade tower. Wilbur (but not Orville) made about a dozen free glides on only a single day. For those tests, the brothers trekked four miles south to the Kill Devil Hills, a group of sand dunes up to 100 feet high (where they made camp in each of the next three years). Although the glider's lift was less than expected (causing most tests to be unmanned), the brothers were encouraged because the craft's front elevator worked well and they had no accidents. However, the small number of free glides meant they were not able to give wing-warping a true test. Orville at Kitty Hawk with the 1901 glider, its nose pointed skyward; it had no tail. Hoping to improve lift, they built the 1901 glider with a much larger wing area and made 50 to 100 flights in July and August for distances of 20 to 400 ft. The glider stalled a few times, but the parachute effect of the forward elevator allowed Wilbur to make a safe flat or "pancake" landing, instead of a nose-dive. These incidents wedded the Wrights even more strongly to the canard design, which they did not give up until 1910. The glider, however, delivered two major disappointments. It produced only about one-third the lift calculated and sometimes failed to respond properly to wing-warping, turning opposite the direction intended—a problem later known as adverse yaw. On the trip home after their second season, Wilbur, stung with disappointment, remarked to Orville that man would fly, but not in their lifetimes. The poor lift of the gliders led the Wrights to question the accuracy of Lilienthal's data, as well as the "Smeaton coefficient" of air pressure, which had been used for over 100 years and was part of the accepted equation for lift. The Wrights—and Lilienthal—used the equation to calculate the amount of lift that wings of various sizes would produce. Based on measurements of lift and wind during the 1901 glider's kite and free flights, Wilbur believed (correctly, as tests later showed) that the Smeaton number was very close to .0033, not the traditionally used 60% larger .0054, which would exaggerate predicted lift. Back home, furiously pedaling a strange-looking bicycle on neighborhood streets, they conducted makeshift open-air tests with a miniature Lilienthal airfoil and a counter-acting flat plate, which were both attached to a freely rotating third bicycle wheel mounted horizontally in front of the handlebars. The results, based on which way the third wheel turned, confirmed their suspicion that published data on lift were unreliable and encouraged them to expand their investigation. They also realized that trial-and-error with different wings on full-size gliders was too costly and time-consuming. Putting aside the three-wheel bicycle, they built a six-foot wind tunnel in their shop and conducted systematic tests on miniature wings from October to December 1901. 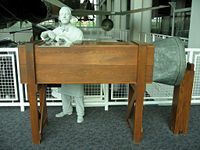 The "balances" they devised and mounted inside the tunnel to hold the wings looked crude, made of bicycle spokes and scrap metal, but were "as critical to the ultimate success of the Wright brothers as were the gliders." The devices allowed the brothers to balance lift against drag and accurately calculate the performance of each wing. They could also see which wings worked well as they looked through the viewing window in the top of the tunnel. Lilienthal had made "whirling arm" tests on only a few wing shapes, and the Wrights mistakenly assumed the data would apply to their wings, which had a different shape. The Wrights took a huge step forward and made basic wind tunnel tests on 200 wings of many shapes and airfoil curves, followed by detailed tests on 38 of them. The tests, according to biographer Howard, "were the most crucial and fruitful aeronautical experiments ever conducted in so short a time with so few materials and at so little expense". A key discovery was the benefit of longer narrower wings: in aeronautical terms, wings with a larger aspect ratio (wingspan divided by chord—the wing's front-to-back dimension). Such shapes offered much better lift-to-drag ratio than the broader wings the brothers had tried so far. Wilbur Wright pilots the 1902 glider over the Kill Devil Hills, Oct 10, 1902. The single rear rudder is steerable; it replaced the original fixed double rudder. By 1902 they realized that wing-warping created "differential drag" at the wingtips. Greater lift at one end of the wing also increased drag, which slowed that end of the wing, making the aircraft swivel—or "yaw"—so the nose pointed away from the turn. That was how the tailless 1901 glider behaved. The improved wing design enabled consistently longer glides, and the rear rudder prevented adverse yaw—so effectively, that it introduced a new problem. Sometimes when the pilot attempted to level off from a turn, the glider failed to respond to corrective wing-warping and persisted into a tighter turn. The glider would slide toward the lower wing, which hit the ground, spinning the aircraft around. The Wrights called this "well digging"; modern aviators refer to a "ground loop." Orville apparently visualized that the fixed rudder resisted the effect of corrective wing-warping when attempting to level off from a turn. He wrote in his diary that on the night of October 2, "I studied out a new vertical rudder." The brothers then decided to make the rear rudder movable to solve the problem. They hinged the rudder and connected it to the pilot's warping "cradle," so a single movement by the pilot simultaneously controlled wing-warping and rudder deflection. Tests while gliding proved that the trailing edge of the rudder should be turned away from whichever end of the wings had more drag (and lift) due to warping. The opposing pressure produced by turning the rudder enabled corrective wing-warping to reliably restore level flight after a turn or a wind disturbance. Furthermore, when the glider banked into a turn, rudder pressure overcame the effect of differential drag and pointed the nose of the aircraft in the direction of the turn, eliminating adverse yaw. In short, the Wrights discovered the true purpose of the movable vertical rudder. Its role was not to change the direction of flight, but rather, to aim or align the aircraft correctly during banking turns and when leveling off from turns and wind disturbances. The actual turn—the change in direction—was done with roll control using wing-warping. The principles remained the same when ailerons superseded wing-warping. Wilbur making turn Oct. 24, 1902 with the movable rudder. 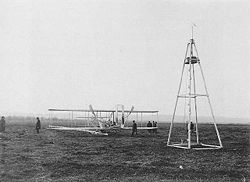 With their new method the Wrights achieved true control in turns for the first time on October 8, 1902, a major milestone. During September and October they made between 700 and 1000 glides, the longest lasting 26 seconds and covering 622.5 ft. Hundreds of well-controlled glides after they made the rudder steerable convinced them they were ready to build a powered flying machine. Thus, did three axis-control evolve: wing-warping for roll (lateral motion), forward elevator for pitch (up and down) and rear rudder for yaw (side to side). 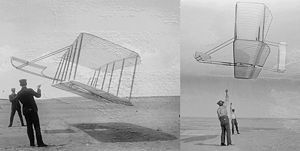 On March 23, 1903 the Wrights applied for their famous patent for a "Flying Machine," based on their successful 1902 glider. Some aviation historians believe that applying the system of three-axis flight control on the 1902 glider was equal to, or even more significant, than the addition of power to the 1903 Flyer. Peter Jakab of the Smithsonian asserts that perfection of the 1902 glider essentially represents invention of the airplane. First flight, December 17, 1903. Photo taken by John T. Daniels, of the Kitty Hawk Life Saving Station, using Orville's tripod camera. In 1903, the brothers built the powered Wright Flyer using their preferred material for construction, spruce, a strong and lightweight wood. They also designed and carved their own wooden propellers, and had a purpose-built gasoline engine fabricated in their bicycle shop. They thought propeller design would be a simple matter and intended to adapt data from shipbuilding. However, their library research disclosed no established formulas for either marine or air propellers, and they found themselves with no sure starting point. They discussed and argued the question, sometimes heatedly, until they concluded that an aeronautical propeller is essentially a wing rotating in the vertical plane. On that basis, they used data from more wind tunnel tests to design their propellers. Wilbur made a March 1903 entry in his notebook indicating the prototype propeller was 66% efficient. Modern wind tunnel tests on reproduction 1903 propellers showed they were more than 75% efficient under the conditions of the first flights, and actually had a peak efficiency of 82 percent. This is a remarkable achievement, considering that modern wooden propellers have a maximum efficiency of 85 percent. 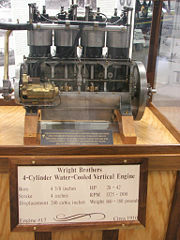 While the early engines used by the Wright brothers are thought to no longer exist, a later example, serial number 17 from circa 1910, is on display at the New England Air Museum in Windsor Locks, Connecticut. Their aluminum engine, built by their shop mechanic Charlie Taylor, was a rarity for the time and was lighter than most available manufactured engines, having the power-to-weight ratio necessary for the Flyer to take off under its own power. In reality the Wright/Taylor engine was a primitive version of modern fuel-injection systems as there was no carburetor or fuel pump to control the flow of petrol. Raw gasoline traveled by gravity through a tube from the strut-mounted fuel tank directly into the crankcase. The propeller drive chains, resembling those of bicycles, were actually supplied by a manufacturer of heavy-duty automobile chain-drives. The Flyer cost less than a thousand dollars to construct. It had a wingspan of 40 ft (12 m), weighed 625 pounds (283 kg), and sported a 12 hp (9 kW), 170 pound (77 kg) engine. "Wilbur started the fourth and last flight at just about 12 o'clock. The first few hundred feet were up and down, as before, but by the time three hundred feet had been covered, the machine was under much better control. The course for the next four or five hundred feet had but little undulation. However, when out about eight hundred feet the machine began pitching again, and, in one of its darts downward, struck the ground. The distance over the ground was measured to be 852 ft; the time of the flight was 59 seconds. The frame supporting the front rudder was badly broken, but the main part of the machine was not injured at all. We estimated that the machine could be put in condition for flight again in about a day or two. The flights were witnessed by five people: Adam Etheridge, John Daniels and Will Dough of the coastal lifesaving crew; area businessman W.C. Brinkley; and Johnny Moore, a boy from the village, making these arguably the first public flights. Daniels took the first flight photo, using Orville's camera. A telegraph operator leaked the news against the brothers' wishes, and highly inaccurate reports ran in several newspapers the next day. After the men hauled the Flyer back from its fourth flight, a sudden gust of wind flipped it over several times, despite the crew's attempt to hold it down. Severely damaged, the airplane never flew again. The brothers shipped it home, and years later Orville restored it, lending it to several U.S. locations for display, then to a British museum (see Smithsonian dispute below), before it was finally installed in the Smithsonian Institution in Washington, D.C. in 1948. In 1904 the brothers built the Flyer II and set up an airfield at Huffman Prairie, a cow pasture eight miles northeast of Dayton which banker Torrance Huffman let them use rent-free. On May 23, they invited reporters to their first flight attempt of the year on the condition that no photographs be taken. Engine troubles and slack winds prevented any flying, and they could manage only a very short hop a few days later with fewer reporters present. Some scholars of the Wrights speculate the brothers may have intentionally failed to fly in order to disinterest reporters in their experiments. Whether that is true is not known, but after their poor showing local newspapers virtually ignored them for the next year and a half. Orville in flight over Huffman Prairie, in Wright Flyer II. Flight #85, approximately 1,760 ft in 40 1/5 seconds, Nov. 16, 1904. The Wrights were glad to be free from the distraction of reporters. The absence of newsmen also reduced the chance of competitors learning their methods. After the Kitty Hawk powered flights, the Wrights made a decision to begin withdrawing from the bicycle business and devote themselves to creating and marketing a practical airplane. The decision was financially risky, since they were neither wealthy nor government funded (unlike other experimenters such as Ader, Maxim, Langley and Santos-Dumont). They did not have the luxury of giving away their invention. It was to be their livelihood. Thus, their secrecy intensified, encouraged by the advice of their patent attorney not to reveal details of their machine. At Huffman Prairie, lighter winds and lower air density than in Kitty Hawk (due to Ohio's higher altitude and higher temperatures) made takeoffs very difficult, and they had to use a much longer starting rail, stretching to hundreds of feet, compared to the 60-foot rail at Kitty Hawk. During the spring and summer they suffered many hard landings, real crackups, repeated Flyer damage, and bodily bumps and bruises. On August 13, making an unassisted takeoff, Wilbur finally exceeded their best effort at Kitty Hawk with a flight of 1,300 ft. Then they decided to use a weight-powered catapult to make takeoffs easier and tried it for the first time on September 7. On September 20, 1904 Wilbur flew the first complete circle in history by a heavier-than-air machine, covering 4,080 feet in about a minute and a half. By the end of the year, the brothers had made 105 flights over the rather soggy 85acre pasture, which, remarkably, is virtually unchanged today from its original condition and is now part of Dayton Aviation Heritage National Historical Park, adjacent to Wright-Patterson Air Force Base. In 1905 the brothers built the Flyer III, which had the same marginal performance as the first two Flyers. Its maiden flight was June 23 and its first several flights were no longer than ten seconds. After Orville suffered a bone-jarring crackup on July 14, they rebuilt the Flyer with the forward elevator and rear rudder both enlarged and placed several feet farther away from the wings. Wright Flyer III piloted by Orville over Huffman Prairie, October 4, 1905. Flight #46, covering 20¾ miles in 33 minutes 17 seconds. Last photographed flight of the year. The modifications greatly improved stability and control, setting the stage for a series of six dramatic "long flights" ranging from 17 to 38 minutes and 11 to 24 miles around the three-quarter mile course over Huffman Prairie between September 26 and October 5. Wilbur made the last and longest flight, 24.5 miles in 38 minutes and 3 seconds, ending with a safe landing when the fuel ran out. The flight was seen by a number of people, including several invited friends, their father Milton, and neighboring farmers. Reporters showed up the next day (only their second appearance at the field since May the previous year), but the brothers declined to fly. The long flights convinced the Wrights they had achieved their goal of creating a flying machine of "practical utility" which they could offer to sell. The only photos of the flights of 1904-1905 were taken by the brothers. In 1904 Ohio beekeeping businessman Amos Root, a technology enthusiast, saw a few flights including the first circle. Articles he wrote for his beekeeping magazine were the only published eyewitness reports of the Huffman Prairie flights, except for the unimpressive early hop local newsmen saw. Root offered a report to Scientific American magazine, but the editor turned it down. As a result, the news was not widely known outside of Ohio, and was often met with skepticism. The Paris edition of the Herald Tribune headlined a 1906 article on the Wrights "FLYERS OR LIARS?" The Wright brothers were, in fact, complicit in the lack of attention they received. Wary of the competition stealing their plans, after 1905 they refused to make public flights or take part in air shows unless they had a firm contract to sell their airplane. They attempted to interest the military in the U.S., France, Britain, and Germany, but were rebuffed because they insisted on a signed contract before giving a demonstration. American bureaucrats were particularly unreceptive, having recently spent $50,000 on the Langley Aerodrome, only to see it plunge twice into the Potomac River "like a handful of mortar." Thus, doubted or scorned, the Wright brothers continued their work in semi-obscurity, while other aviation pioneers like Brazilian Alberto Santos-Dumont and American Glenn Curtiss were occupying the limelight. The Wright brothers made no flights at all in 1906 and 1907. After finally signing contracts with a French company and the U.S. Army, they went back to Kitty Hawk in May 1908 with the 1905 Flyer, modified with seats for pilot and passenger, and began practicing for their all-important demonstration flights. Their contracts required them to be able to carry a passenger. After tests with sandbags in the passenger seat, Charlie Furnas, a helper from Dayton, became the first fixed-wing aircraft passenger on a few short flights May 14. For safety, and as a promise to their father, Wilbur and Orville did not fly together. Their 1903 patent application, which they wrote themselves, was rejected. In early 1904 they hired Ohio patent attorney Henry Toulmin, and on May 22, 1906 they were granted U.S. Patent 821393 (PDF) for a "Flying Machine." Significantly, this patent illustrated a non-powered flying machine—namely, the 1902 glider. The patent's importance lies in its claim of a new and useful method of controlling a flying machine, powered or not. The technique of wing-warping is described, but the patent explicitly states that wing-warping need not be the only method that could be employed to vary the angle presented to the air by the outer portions of a machine's wings. The concept of varying the angle near the wingtips, by whatever means, is central to the patent. The broad protection intended by this language succeeded when the Wrights won patent infringement lawsuits against Glenn Curtiss and other early aviators, who adopted ailerons while the Wrights continued to use wing-warping. The courts decided that ailerons were also covered by the patent (see Patent War section below). The patent also describes the steerable rear vertical rudder and its innovative use in combination with wing-warping, enabling the airplane to make a coordinated turn, a technique that prevents hazardous adverse yaw, the problem Wilbur had when trying to turn the 1901 glider. Finally, the patent describes the forward elevator, used for ascending and descending. Facing deep skepticism in the French aeronautical community and outright scorn by some newspapers that called him a "bluffeur," Wilbur began official public demonstrations on August 8, 1908 at the Hunaudières horse racing track near the town of Le Mans, France. His first flight lasted only one minute 48 seconds, but his ability to effortlessly make banking turns and fly a circle amazed and stunned onlookers, including several pioneer French aviators, among them Louis Bleriot. In the following days Wilbur made a series of technically challenging flights including figure-eights, demonstrating his skills as a pilot and the capability of his flying machine, which far surpassed those of all other pilot pioneers. The French public was thrilled by Wilbur's feats, and the Wright brothers became world famous overnight. On October 7 Edith Berg, the wife of the brothers' European business agent, became the first American woman airplane passenger when she flew with Wilbur. 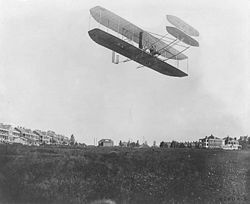 Orville followed his brother's success by demonstrating another nearly identical flyer to the United States Army at Fort Myer, Virginia, starting on September 3, 1908. On September 9 he made the first hour-long flight, enduring 62 minutes and 15 seconds. On September 17 Army lieutenant Thomas Selfridge rode along as his passenger, serving as an official observer. A few minutes into the flight at an altitude of about 100 ft, a propeller split, sending the aircraft out of control. Selfridge was killed in the crash, the first person to die in powered fixed-wing aircraft. Orville was badly injured, suffering a broken left leg and four broken ribs. The brothers' sister Katharine, a school teacher, rushed from Dayton to Washington and stayed by Orville's side for the many weeks of his hospitalization. She helped negotiate a one-year extension of the Army contract. A friend visiting Orville in the hospital asked, "Has it got your nerve?" "Nerve?" repeated Orville, slightly puzzled. "Oh, do you mean will I be afraid to fly again? The only thing I'm afraid of is that I can't get well soon enough to finish those tests next year." Deeply shocked by the accident, Wilbur determined to make even more impressive flight demonstrations; in the ensuing days and weeks he set new records for altitude and duration. In January 1909 Orville and Katharine joined him in France, and for a time they were the three most famous people in the world, sought after by royalty, the rich, reporters and the public. The kings of England, Spain and Italy came to see Wilbur fly. The Wrights traveled to Pau, in the south of France, where Wilbur made many more public flights, giving rides to a procession of officers, journalists and statesmen—and his sister Katharine on February 15. He trained two French pilots, then transferred the airplane to the French company. In April the Wrights went to Italy where Wilbur assembled another Flyer, giving demonstrations and training more pilots. A cameraman climbed aboard and made the first motion picture from an airplane. After their return to the U.S., the brothers and Katharine were invited to the White House where President Taft bestowed awards upon them. Dayton followed up with a lavish two-day homecoming celebration. In July 1909 Orville, with Wilbur assisting, completed the proving flights for the U.S. Army, meeting the requirements of a two-seater able to fly with a passenger for an hour at an average of speed of 40 miles an hour (64 km/h) and land undamaged. They sold the aircraft to the Army's Aeronautical Division, U.S. Signal Corps for $30,000 (which included a $5,000 bonus for exceeding the speed specification). Wilbur climaxed an extraordinary year in early October when he flew at New York City's Hudson-Fulton celebrations, circling the Statue of Liberty and making a 33-minute flight up and down the Hudson River alongside Manhattan in view of up to one million New Yorkers. These flights solidly established the fame of the Wright brothers in America. 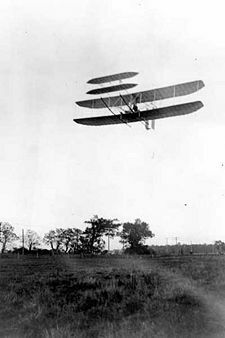 On May 25, 1910 back at Huffman Prairie, Orville piloted two unique flights. First, he took off on a six-minute flight with Wilbur as his passenger, the only time the Wright brothers ever flew together. They received permission from their father to make the flight. They had always promised Milton they would never fly together—to avoid the chance of a double tragedy and to ensure one brother would remain to continue their experiments. Next, Orville took his 82-year old father on a nearly seven-minute flight, the first and only one of Milton Wright's life. 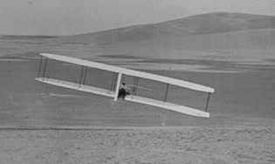 The airplane rose to about 350 ft while the elderly Wright called to his son, "Higher, Orville, higher!" In 1908 the brothers warned Glenn Curtiss not to infringe their patent by profiting from flying or selling aircraft that used ailerons. Curtiss refused to pay license fees to the Wrights and sold a plane to the Aeronautic Society of New York in 1909. The Wrights filed a lawsuit, beginning a years-long legal conflict. They also sued foreign aviators who flew at U.S. exhibitions, including the leading French aviator Louis Paulhan. The brothers' licensed European companies, which owned foreign patents the Wrights had received, sued manufacturers in their countries. The European lawsuits were only partly successful. Despite a pro-Wright ruling in France, legal maneuvering dragged on until the patent expired in 1917. 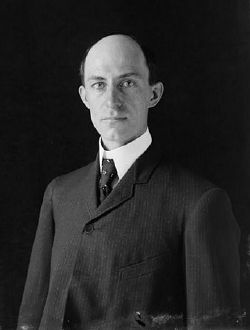 A German court ruled the patent invalid due to prior disclosure in speeches by Wilbur Wright in 1901 and Octave Chanute in 1903. In the U.S. the Wrights made an agreement with the Aero Club of America to license airshows which the Club approved, freeing participating pilots from a legal threat. Promoters of approved shows paid fees to the Wrights. The Wright brothers won their initial case against Curtiss in February 1913, but the decision was appealed. From 1910 until his death from typhoid fever in 1912, Wilbur took the leading role in the patent struggle, traveling incessantly to consult with lawyers and testify in what he felt was a moral cause, particularly against Curtiss, who was creating a large company to manufacture aircraft. The Wrights' preoccupation with the legal issue hindered their development of new aircraft designs, and by 1911 Wright aircraft were considered inferior to those made by other firms in Europe. Indeed, aviation development in the US was suppressed to such an extent that when the US entered World War I no acceptable American-designed aircraft were available, and the US forces were compelled to use French machines. Orville and Katharine Wright believed Curtiss was partly responsible for Wilbur's premature death, which occurred in the wake of his exhausting travels and the stress of the legal battle. In January 1914 a U.S. Circuit Court of Appeals upheld the verdict in favor of the Wrights against Curtiss, whose company continued to avoid penalties through legal tactics. Since Orville was planning to sell the Wright company, no follow ups were made after the legal victory. In 1917, with World War I underway, the U.S. government stepped in to supervise a cross-licensing organization in which member companies paid a blanket fee for the use of aviation patents, including the original and subsequent Wright patents. The Wright-Martin company (successor to the Wright company) and the Curtiss company (which held a number of its own patents) each received a $2 million payment. The "patent war" ended, although side issues lingered in the courts until the 1920s. In a twist of irony, the Wright Aeronautical Corporation (another successor) and the Curtiss Aeroplane company merged in 1929 to form the Curtiss-Wright corporation, which remains in business today producing high-tech components for the aerospace industry. The lawsuits damaged the public image of the Wright brothers, who were generally regarded before this as heroes. Critics said the brothers were greedy and unfair, and compared their actions unfavorably to European inventors, who refused to enforce restrictive patents on this new technology. Supporters said the brothers were protecting their interests and were justified in expecting fair compensation for the years of work leading to their successful inventions. Their long friendship with Octave Chanute collapsed after he publicly criticized their actions. The Wright Company was incorporated on November 22, 1909. The brothers sold their patents to the company for $100,000 and also received one-third of the shares in a million dollar stock issue and a ten percent royalty on every airplane sold. In mid-1910 the Wrights changed the design of their airplane, moving the horizontal elevator from the front to the back and adding wheels. It had become apparent by then that a rear elevator would make the airplane easier to control, especially as higher speeds grew more common. This aircraft was designated the "Model B," although the original canard design was never referred to as the "Model A" by the Wrights. There were not many customers for airplanes, so in the spring of 1910 the Wrights hired and trained a team of salaried exhibition pilots to show off their aircraft and win prize money for the company—despite Wilbur's disdain for what he called "the mountebank business." The team debuted at the Indianapolis Speedway on June 13. Before the year was over, pilots Ralph Johnstone and Arch Hoxsey died in airshow crashes, and in November 1911 the brothers disbanded the team on which nine men had served (four other former team members died in crashes afterward). The Wright Company transported the first known commercial air cargo on November 7, 1910 by flying two bolts of dress silk 65 miles from Dayton to Columbus, Ohio for the Moorehouse-Marten Department Store, which paid a $5,000 fee. Company pilot Phil Parmelee made the flight—which was more an exercise in advertising than a simple delivery—in an hour and six minutes with the cargo strapped in the passenger's seat. The silk was cut into small pieces and sold as souvenirs. Between 1910 and 1916 the Wright Company flying school at Huffman Prairie trained 115 pilots who were instructed by Orville and his assistants. Several trainees became famous, including Henry "Hap" Arnold, who rose to Five-Star General, commanded U.S. Army Air Forces in World War II, and became first head of the U.S. Air Force; Calbraith Perry Rodgers, who made the first coast-to-coast flight in 1911 (with many stops and crashes) in a Wright Model EX named the "Vin Fiz" after the sponsor's soft drink; and Eddie Stinson, founder of Stinson Aircraft. Neither brother married. Wilbur once quipped that he did not have time for a wife and an airplane. 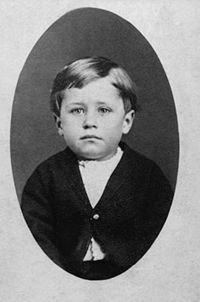 Wilbur, age 45, died of typhoid fever on the morning of Thursday, May 30, 1912. Orville sold his interests in the plane company in 1915. 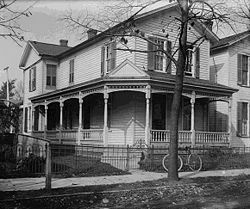 He, Katharine and their father Milton moved to a mansion, Hawthorn Hill, Oakwood, Ohio, which the newly wealthy family built. There, they lived quietly. Milton died in his sleep in 1917. Katharine married in 1926, which upset Orville. He cut her off, refusing to meet with or write to her. He finally agreed to see her just before she died of pneumonia in 1929. Orville died in 1948, from a heart attack. Both brothers are buried at the family plot at Woodland Cemetery, Dayton, Ohio. The Flyer I is now on display in the National Air and Space Museum, a division of the Smithsonian Institution in Washington, D.C. (See The Smithsonian Issue). The Flyer III, the only fixed-wing aircraft designated a National Historic Landmark, was dismantled after the 1905 flights, but rebuilt and flown in 1908 at Kitty Hawk, and was restored in the late 1940s with the help of Orville. It is on display at Dayton, Ohio in the John W. Berry Sr., Wright Brothers Aviation Center at Carillon Historical Park. 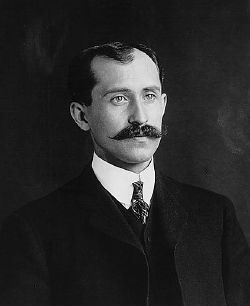 The display space for the aircraft was designed by Orville Wright. Orville instructed that, upon his death, The Franklin Institute in Philadelphia should receive his collection of airfoils and devices. The Franklin Institute was the first scientific organization to give the Wright brothers credit and ranking for achieving sustained powered flight. Today, The Franklin Institute Science Museum holds the largest collection of artifacts from the Wright brothers' workshop. Glenn Curtiss or an assistant coaxes the structurally modified Langley Aerodrome into the air above the surface of Keuka Lake near Hammondsport, N.Y., September 17, 1914. Orville repeatedly objected to misrepresentation of the Aerodrome, but the Smithsonian was unyielding. Orville responded by loaning the restored 1903 Kitty Hawk Flyer to the London Science Museum in 1928, refusing to donate it to the Smithsonian while the Institution "perverted" the history of the flying machine. Charles Lindbergh attempted to mediate the dispute, to no avail. In 1942, after years of bad publicity, and encouraged by Wright biographer Fred Kelly, the Smithsonian finally relented by publishing, for the first time, a list of the Aerodrome modifications and recanting misleading statements it had made about the 1914 tests. Orville then privately requested the British museum to return the Flyer, but the airplane remained in protective storage for the duration of World War II and finally came home after Orville's death. On November 23, 1948 the executors of Orville's estate signed an agreement for the Smithsonian to purchase the Flyer for one dollar. At the insistence of the executors, the agreement also included strict conditions for display of the airplane. The agreement reads, in part, "Neither the Smithsonian Institution or its successors, nor any museum or other agency, bureau or facilities administered for the United States of America by the Smithsonian Institution or its successors shall publish or permit to be displayed a statement or label in connection with or in respect of any aircraft model or design of earlier date than the Wright Aeroplane of 1903, claiming in effect that such aircraft was capable of carrying a man under its own power in controlled flight." If this agreement is not fulfilled, the Flyer can be reclaimed by the heir of the Wright brothers. After a ceremony in the Smithsonian museum, the Flyer went on public display on December 17, 1948, the 45th anniversary of the only day it ever flew. The Wright brothers' nephew Milton (Lorin's son), who had seen gliders and the Flyer under construction in the bicycle shop when he was a boy, gave a brief speech and formally transferred the airplane to the Smithsonian. Numerous claims before the Wrights aspire to the title of first powered, manned, controlled, and self-sustaining heavier than air flight, or variations of this classification—see First flying machine for details. 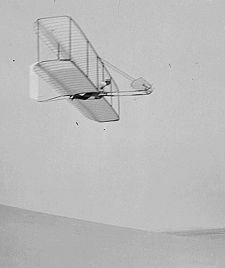 Several claims actually were made after the Wrights' first successful flights, and attempt to discount the achievement due to one or more of the following technical reasons: the takeoff rail, the lack of wheels, the need for a headwind, and, beginning in 1904, the use of a catapult. Such criticisms are based on the fact that the Wright Flyer did not operate exactly the way people, then and now, expect of fixed-wing aircraft. The Flyer certainly did not incorporate all the elements and conveniences of a modern airplane, such as wheels. Criticism, however, while faulting the Flyer on the points listed above, often pays less attention to an additional but essential fact: the Flyer, especially by 1905, was the first heavier-than-air, manned, powered, winged machine to fly successfully under full control, using aerodynamic principles developed by the Wright brothers and applied since then on all practical airplanes. 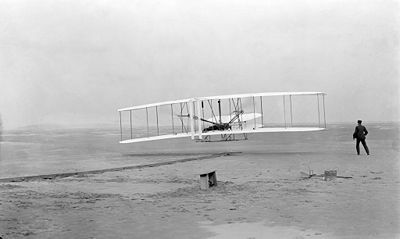 That achievement defines the Wright brothers, in the view of many people, as the inventors of the airplane. The Wright brothers' December 17, 1903 flight is recognized by the Fédération Aéronautique Internationale, the standard setting and record-keeping body for aeronautics and astronautics, as "the first sustained and controlled heavier-than-air powered flight." While Wilbur and Orville separately flew the same make of their aircraft the brothers control arrangements were different. They're labeled by the Smithsonian Institution National Air & Space Museum as "The Wilbur Method" and "The Orville Method." The "Wilbur Method" first introduced in August 1908 at LeMans(or possibly at Kitty Hawk that May of 1908) had the lateral and yaw controls working from the same lever at the pilot's right hand. However the two controls were still separate from one another while being joined by a common swiveling flange mounted on the lower wing in back of the pilot & passenger. A forward/backward movement controlled the rudder while a sideways or left-to-right controlled the wing-warping. The left-hand lever controlled the pitch or forward elevator by way of two long moment arms and light chain. This remained the same in the "Orville Method." The "Orville Method" as mentioned above retained the same forward elevator control arrangement as the "Wilbur Method." The Orville Method, introduced at Ft.Myer in September 1908 (or possibly at Kitty Hawk in May of that year) differed in its arrangement of the lateral & yaw controls on the pilot's right stick. In the Orville Method a light chain is run from a flanged knob or handle atop the stick through a large pulley at the bottom of the stick to solid wires which are joined by pulleys at a central point. The maze of wiring from this point lead to the four points of the wing-warping on the trailing edges of the upper & lower wings. By moving the knob atop the stick lateral (roll) movement is enabled. The rudder arrangement for the "Orville Method" uses light chained guyed to the same pulley at the bottom of the right-hand control stick used for the wing warping. The Orville Method of rudder control differs from the Wilbur Method of rudder control in that the chain & wiring run for a longer distance from the rudder directly to the right-hand control stick at the front of the aircraft. Transmission of the Wilbur Method of rudder control comes by attaching a rod from the pilot's right-hand stick to the flange in back of the pilot and passenger then wiring from the flange to the rudder itself. The brothers' two different systems of control arrangement were later utilized in The U.S. and in Europe on aircraft of their design. Wilbur had trained a number of pilots in France & Italy and his system of control arrangement was adapted by pilots flying Wright Flyers in Europe. Orville had trained a number of American pilots in Dayton and the first pilots for the Wright Exhibition Team at Montgomery Alabama and his system was utilized by American pilots flying Wright Flyers. The U.S. states of Ohio and North Carolina both take credit for the Wright brothers and their world-changing inventions—Ohio because the brothers developed and built their design in Dayton, and North Carolina because Kitty Hawk was the site of the first flight. With a spirit of friendly rivalry, Ohio adopted the slogan "Birthplace of Aviation" (later "Birthplace of Aviation Pioneers," recognizing not only the Wrights, but also John Glenn and Neil Armstrong, both Ohio natives), while North Carolina has adopted the slogan "First In Flight." Each state features these phrases on their standard-issue state automobile license plates, and both states also included an image of a Wright Flyer on their respective 50 state quarters designs. As the positions of both states can be factually defended, and each played a significant role in the history of flight, neither state truly has an exclusive claim to the Wrights' accomplishment. Neil Armstrong, at a presentation at the National Museum of the United States Air Force in Dayton, Ohio, joked that there is enough credit for both states: North Carolina provided the right winds and soft landing material and Dayton, Ohio provided the know-how, resources and engineering. ↑ Fred Howard, Wilbur And Orville: A Biography of the Wright Brothers. (Mineola, NY: Dover Publications, 1998, ISBN 0486402975), 89; Peter L. Jakab, Visions of a Flying Machine: The Wright Brothers and the Process of Invention. (Washington, DC: Smithsonian, 1997, ISBN 1560987480), 183. ↑ Tom D. Crouch, The Bishop's Boys: A Life of Wilbur and Orville Wright (New York, NY: W. W. Norton & Company), 169. ↑ David Wallechinsky and Amy Wallace, The New Book of Lists (Edinburgh, Scotland: UK Canongate, 2005, ISBN 1841957194), 12. ↑ Tom Crouch, The Bishop's Boys, 56-57. ↑ Crouch, Chapter 10, "The Year of the Flying Machine," and Chapter 11, "Octave Chanute." ↑ James Tobin, To Conquer the Air. (New York, NY: Simon & Schuster, 2003, ISBN 0743255364), 92. ↑ Howard, 52; Crouch, 198. ↑ Inventing the Airplane Wright Brothers Aeroplane Company,] Wright Brothers Aeroplane Company. Retrieved July 25, 2015. ↑ John D. Anderson, Inventing Flight: The Wright Brothers and Their Predecessors. (Baltimore: Johns Hopkins University Press, 2004, ISBN 0801868750), 134. ↑ Wolfgang Langewiesche, Stick and Rudder: An Explanation of the Art of Flying (New York, NY: McGraw-Hill, 1943, ISBN 0070362408), 163; Jakab, "Visions," 183-184. ↑ "1903 - Who Made the First Flight?". TheWrightBrothers.org. Retrieved June 23, 2007. ↑ Fred C. Kelly, The Wright Brothers: A Biography Chap. IV, (New York, NY: Dover Publications, 1989, ISBN 0486260569), 101-102. ↑ Fred Howard, Wilbur and Orville - A Biography of the Wright Brothers (New York, NY: Dover Publications, 1998, ISBN 0486402975), 154-155. ↑ Michael Sharpe, Biplanes, Triplanes and Seaplanes (Friedman/Fairfax, 2000, ISBN 1586633007), 311. ↑ Charlotte Gray, Reluctant Genius: Alexander Graham Bell and the Passion for Invention (Arcade Publishing, 2006, ISBN 1559708093). ↑ The first woman airplane passenger was Thérèse Peltier on July 8, 1908 when she made a flight of 656 ft with Léon Delagrange in Milan, Italy. Therese Peltier Women in Aviation and Space History, Smithsonian. Retrieved July 25, 2015. ↑ Twelve years later, after Orville suffered increasingly severe pains, X-rays revealed the Ft. Myer accident had also caused three hip bone fractures and a dislocated hip. Kelly, Fred G. Chapter XIV, p. 230. ↑ Crouch, ch. 31, "The Mountebank Game." ↑ Howard, ch. 46, "The Aerodrome Affair." ↑ Available upon request from the National Air and Space Museum of the Smithsonian Institution. ↑ First Airplane Flight Wright Brothers History. Retrieved July 25, 2015. Anderson, John D. Inventing Flight: The Wright Brothers and Their Predecessors. Baltimore: Johns Hopkins University Press, 2004. ISBN 0801868750. Gray, Charlotte. Reluctant Genius: Alexander Graham Bell and the Passion for Invention. Arcade Publishing, 2006. ISBN 1559708093. Howard, Fred. Wilbur And Orville: A Biography of the Wright Brothers. Mineola, NY: Dover Publications, 1998. ISBN 0486402975. Jakab, Peter L. Visions of a Flying Machine: The Wright Brothers and the Process of Invention. Washington, DC: Smithsonian, 1997. ISBN 1560987480. Langewiesche, Woflgang. Stick and Rudder: An Explanation of the Art of Flying. New York, NY: McGraw-Hill, 1972. ISBN 0070362408. Sharpe, Michael. Biplanes, Triplanes and Seaplanes. Friedman/Fairfax, 2000. ISBN 1586633007. Wallechinsky, David & Amy Wallace. The New Book of Lists. Edinburgh, Scotland: UKCanongate, 2005. ISBN 1841957194. Walsh, John E. One Day at Kitty Hawk: The Untold Story of the Wright Brothers. New York, NY: Ty Crowell Co., 1975. ISBN 0690001037. Wright, Orville. How We Invented the Airplane. Mineola, NY: Dover Publications, 1988. ISBN 0486256626. All links retrieved July 25, 2015. Wilbur Wright Birthplace & Museum. Some Aeronautical Experiments by Wilbur Wright, to Western Society of Engineers Sept 18, 1901. FirstFlight - flight simulation, videos and experiments. Plane truth: list of greatest technical breakthroughs in manned flight. Video clips about the invention of the fixed-wing aircraft. The Pioneer Aviation Group web site contains many pictures of early flying machines and a comprehensive chronology of flight attempts. HTML version of the Wright brothers' original patent. Analysis of Wright Brothers' work. PBS Nova: The Wright Brothers' Flying Machines. National Park Service, Wright Brothers' Memorial. Smithsonian Stories of the Wright flights. The Wright Brothers' Engines and Their Design by Leonard S. Hobbs, Smithsonian Institution Press, 1971. This page was last modified on 25 July 2015, at 20:57.